Spread the butter on 1 side of each slice of bread. On the other side of half of the slices spread peanut butter. Place banana slices on top of peanut butter. Drizzle honey over bananas. 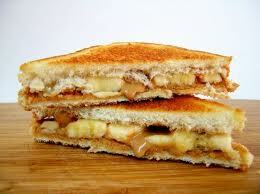 Place 3 bacon slices on top of the banana, then place the remaining buttered bread slices on top, butter-side-out. Recipe courtesy Peanut Butter & Co.